19th-century purple Belgian velvet with silver bosses and 2 clasps. Purchased with the assistance of the Fellows, 1953. Owned in 1732 by Count Ferdinand de Plettenberg, whose signature appears on fol. 1r; his library was housed in the castle of Nordkirchen near Münster, Westphalia; Nordkirchen ex-libris stamp on verso of 3rd flyleaf; descended to Countess Maria de Plettenberg-Mietingen, married in 1833 to Count Nicolas d'Esterhazy Galantha, died 1861; her ex-libris, numbered 1039, pasted inside front cover; in 1903 Nordkirchen became the property of Duke Engelberg d'Arenberg; purchased from Germain Seligman in 1953. 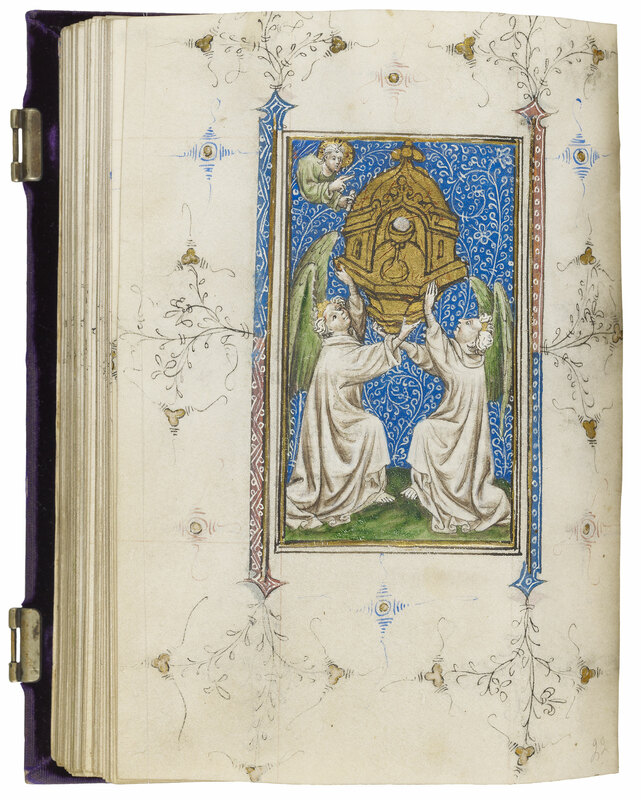 Ms. book of hours, mostly for the use of Windesheim (Hours of the Virgin); written and illuminated in the Netherlands, perhaps in Delft, ca. 1415-1420; an added section (fol. 194-214) which is not illuminated, was composed in Flanders, ca. 1450. Decoration: 53 full-page miniatures, 7 half-page miniatures, 10 historiated initials, 24 calendar illustrations, border decoration on all text pages; Dutch Gothic style. Artist: Master of the Morgan Infancy Cycle.